Weasels are some of the toughest, most rugged and cleaver creatures around. 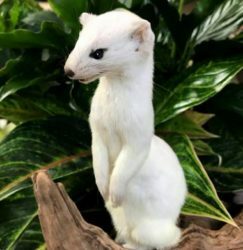 The ermine is no exception to this and fully embraces its role as one of nature’s most fearless hunters. Despite their size and cute appearance, these crafty weasels are actually full blown carnivores. Subsisting on mice, shrews, voles, insects, frogs, fish, birds and eggs. They have even been known to take down rabbits twice their size. For such an adorable animal, they sure do have a vicious side. Join us as we deep dive into the surprisingly scrappy world of the fighter of the forests.